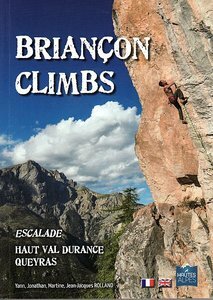 The full name of this guidebook is Escalade en Brianconnais, Haut Val Durance and Queyras, which essentially describes the rock climbing around the Durance Valley in the Hautes Alps near Grenoble (sometimes referred to as the Southern Alps or the Ecrins). The rock climbing areas covered is around the towns of Briancon, Ailefroide, La Vallouise, L'Argentiere-la-bessee & Guillestre. The guidebook describes 11 separate rock climbing areas and 81 major crags ranging from single pitch and multi-pitch sports routes to long classic alpine ascents up to 600m long. At the start of each crag, there is information regarding the type of rock, orientation and therefore exposure to the sun, maximum height of the routes, best time of the year to climb and how long the walk-in is from the car. All the routes are illustrated on either full colour photo-topos or topo diagrams with French grades used throughout. Re-published in 2015 and the guidebook is in French and English text throughout.